Exercise is VITAL to a Healthy Pregnancy - Real Food. Real Fitness. If you have been following my pregnancy posts you know by now I am NOT shy when it comes to exercise and pregnancy. Exercising (especially moderate to high intensity exercise) while pregnant has gotten a bad rap and I am here to tell you that exercise is not only GOOD but extremely beneficial to mom and baby. Sadly in our society many people except and even encourage fulfilling pregnancy cravings by over-indulging in sweets, pizza, or other junk food that is toxic to a growing baby. Then many of these same people are fearful or opinionated about doing something that is extremely healthy and beneficial like exercise. Hmm?? Frustrating to say the least! Most pregnant women have no idea that exercise is so VITAL to the development of their child!!!! I have gotten my fair share of OMG looks and comments while continuing to exercise at a fairly high intensity throughout my entire pregnancy but it does not bother me one bit! Along with daily nutrient dense food choices I know I am doing one of the best things I can for my growing baby and myself. 30 weeks preggo belly shot! For the rest of us preggo mama’s out there exercise does not need to be taken lightly just because you are pregnant. If you were a fitness junkie like me prior to pregnancy there is no need to stop doing what you love! It’s o.k. while pregnant to sweat, and even push yourself and continue with your normal workouts. You know your body best. If anything hurts, you feel overheated or your breathing seems strained for an extended period its time to STOP, take a break,drink some water and regroup! A few other important things to remember are……..
-Ab work such as any crunches can be done up until 12 weeks after that its best to stick with side planks or standing side bends to keep the waist toned. -Avoid any exercise that has you laying flat on your back. This position puts strain on a major vein called the vena cava, which will reduce blood to your heart and uterus possibly making you dizzy, short of breath, or nauseated. -Watch your heart rate it shouldn’t get crazy high but you don’t need to obsess over it. -Any exercise such as crawling, planking, or bending over low can get uncomfortable after 20 weeks and might be better avoided. -Watch your weight load and never lift more than you were pre-pregnancy, especially overhead. You may need to even decrease weight as you get farther in pregnancy. -As your belly and baby grow, long periods of cardio (more than 30 min) can get uncomfortable and leave you running to the bathroom to pee every 10 min. So doing shorter intervals is helpful and less annoying! -DRINK LOTS OF PURE FILTERED WATER BEFORE,DURING,AND AFTER EXERCISE To keep hydrated all day. Remember you are preparing yourself for one of the hardest workouts you will ever do LABOR AND DELIVERY! THINK – strong abs and a fit cardiovascular system can give you more stamina for the pushing stage, just saying! You’re likely to gain less weight. This is an obvious one but its true. Keeping pregnancy weight gain under control is important! Plus women who exercise throughout their pregnancy have a better body image than those who sit out the nine months. You lower your gestational diabetes risk by as much as 27 percent just by exercising daily! That’s huge! A landmark study found that among well-conditioned women who delivered vaginally, those who had continued training throughout their pregnancy experienced active labor for 4 hours and 24 minutes compared with 6 hours and 22 minutes for those who’d quit exercise early on. You may be less prone to morning sickness and nausea. This was true for me. 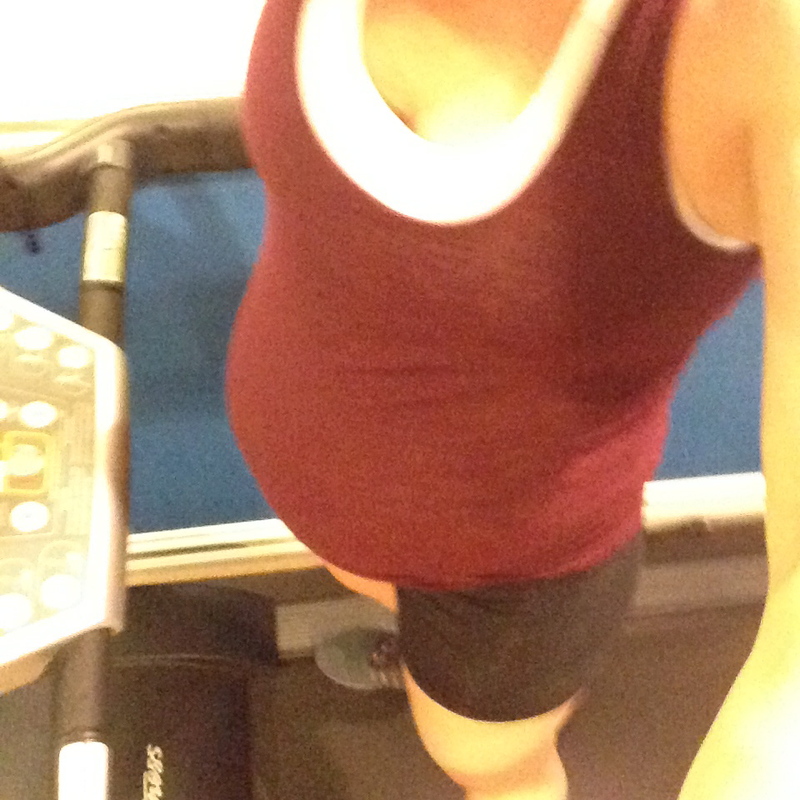 I actually felt exercising helped me feel better during the first trimester. You will experience less swelling and bloating because exercise improves blood flow. You are less likely to get sick as exercise helps keep your immune system in tip top shape. Now this is a cool one! You may boost your child’s athletic potential! One study found that 20-year-olds who were exposed to exercise in utero performed better at sports than same age peers whose mothers did not exercise during pregnancy. Dr. James F. Clapp is the worlds leading authority on the effects of exercise during pregnancy. Dr. Clapp’s research is detailed in his book, Exercising Through Your Pregnancy, which reveals that mental performance and physical attributes are often significantly better in babies of women who exercised during pregnancy. The mental and physical benefits of exercise help to create an optimal environment for the mind, body and brain of a fetus. 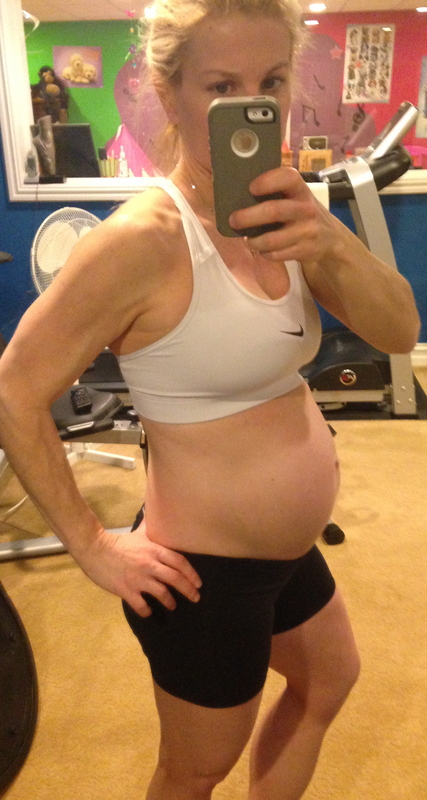 With all that said I am glad for my 4th pregnancy I have continued to exercise 6 days a week. It has been one of the best decisions I have made and stuck to! When I am not in the gym or in a HIIT (high intensity interval training) class you can find me getting my workout in right at home in my basement. Belly getting to big for treadmill, I have to watch out I don’t bump the front bar! Also at some point in the day I walk my dog at least 1 mile. This totals around 45-60 min of exercise 6 days per week, Sunday is always my rest day! How about you, did you exercise while pregnant?? Or will you now after reading this?